Monday's trip comes during a rare moment of goodwill stemming from the Winter Olympics. SEOUL, South Korea — South Korea’s president will send a delegation led by his national security director to North Korea this week for talks on how to ease nuclear tensions and help arrange the restart of dialogue between Pyongyang and Washington, officials said Sunday. The 10-member delegation headed by National Security Director Chung Eui-yong is to fly to Pyongyang on Monday for a two-day visit that includes talks with senior North Korean officials. The discussions will deal with how to promote peace on the Korean Peninsula, improve ties between the Koreas and foster an environment to resume talks between Pyongyang and Washington, South Korean President Moon Jae-in’s office said. 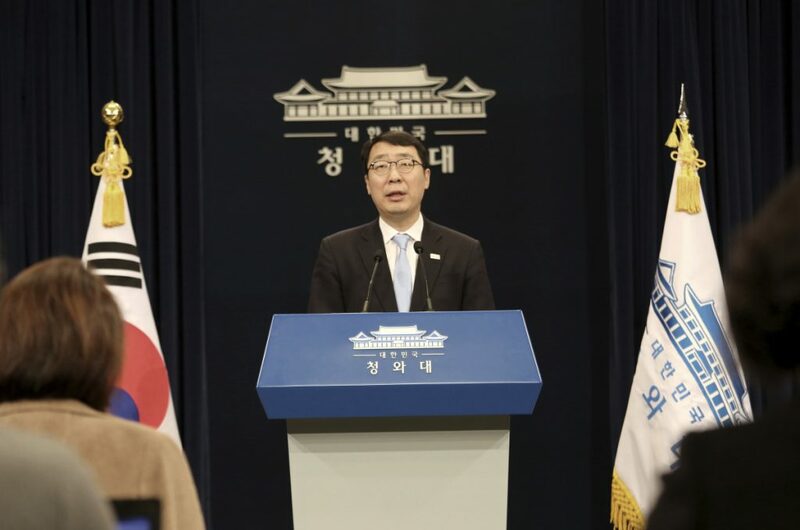 After its Pyongyang trip, the South Korean delegation will visit Washington to brief U.S. officials about its talks with the North Koreans, senior presidential official Yoon Young-chan said at a televised news conference. He said the South Korean delegation includes National Intelligence Service Director Suh Hoon and Vice Unification Minister Chun Hae-sung. U.S. officials have said North Korea must take disarmament steps before talks can restart, and North Korea has insisted it won’t place its nuclear program on the negotiating table. In the past, South Korea sent special envoys to Pyongyang to reach breakthrough deals aimed at reducing animosities and securing higher-level talks. The Koreas’ two past summit talks in 2000 and 2007, were both held after ranking South Korean officials went to Pyongyang and worked out details of the summits in advance. During the Olympics, the Koreas fielded their first joint Olympic squad in women’s ice hockey and had their athletes parade together during the opening ceremony. President Trump responded by saying talks will happen only “under the right conditions.” Moon has yet to accept Kim’s invitation to visit Pyongyang. During the Olympics, Moon only said “let’s not get too far ahead” on a summit and that the Koreas should create an unspecified “environment” for the talks.